A survey today shows that new housing supply reached a nine year high in 2018, but still remains at half of the country's estimated demand. 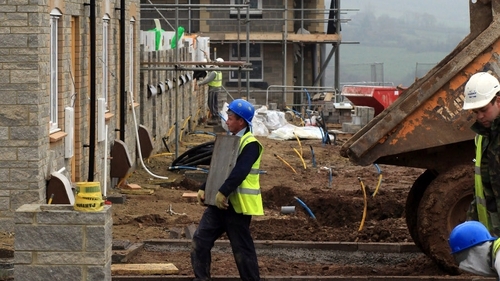 The latest Goodbody BER Housebuilding Tracker estimates that 18,855 new dwellings were completed in Ireland last year. This marks an annual growth rate of 31% for the full year and is the largest annual output since 2009. Goodbody estimates that in the fourth quarter of 2018, a total of 6,273 new dwellings were completed, up 37% year on year. The stockbrokers' analysis uses Building Energy Ratings (BER) data as a forecasting tool and is published roughly four weeks ahead of the official CSO data. The tracker showed that all regions of the country saw double-digit growth in 2018, albeit from low levels. The fastest annual growth was registered in the South-East, with an annual increase of 49%. However housebuilding continues to be concentrated in the Greater Dublin Area, with house completions in Dublin up by 33% in 2018 to 7,404. Completions in Dublin's commuter belt grew by 34% to 3,955. Goodbody noted a rapid increase in large housing schemes in 2018, up 45% in the year to 11,469 and representing 62% of total completions. One-off housing represented a further 25% of new completions last year and has been relatively stable over recent years. Goodbody said that apartment completions grew by 8% last year but remained low in both absolute terms (2,428) and relative to housing output overall (13%). The stockbrokers said that uncertainty around building regulations played an important role in the slow delivery of apartment stock last year.